There are a lot of ‘folk names’ given to dragonflies such as ‘Horse stinger’ in the UK. The name may come from from the way a captured dragonfly curls it abdomen as if in an attempt to sting. Another explanation was that they could be seen flying round horses in fields. They were really feeding on the flies attracted to the horses. Occasionally a fly would irritate or bite a horse enough to make it twitch or skip about. People seeing it made the inference that it was the dragon stinging, rather that an unseen fly biting. Dragonflies are fearsome predators of other flying insects but this beautiful creature is harmless to humans. 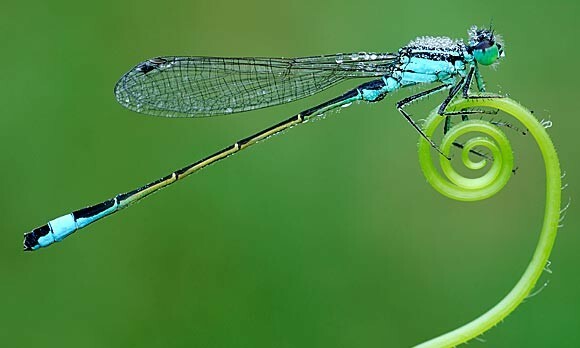 Dragonflies are among the oldest insects on earth, for fossilized remains show that they existed 300 million years ago. This is an interesting time span considering that the famous dinosaur footprints at Minyirr (Gantheaume Point) date from the Cretaceous environment of 130 million year ago. Some of these ancient dragonflies had a wingspan over 60 cm (today the largest wingspan is megaloprepus coerulatus in South America which is 19 cm). There are 4500 different species of dragonfly in the world today (300 species in Australia) varying in size and colour. They are sunlight-loving day flying insects living near water, usually by stagnant pools and marshes. They have four large wings with a lace-like pattern of veins, long slender bodies, a huge head and prominent eyes. Most of them are brilliantly coloured with bodies that are red, blue, green, brown, yellow, and so on. The colour becomes stronger as the insect grows older. Observation here in Broome indicates that dragonflies are of a green, brown colouration. Dragonflies move through the air at tremendous speeds sometimes reaching up to 90 kmph. They can fly for hours on end and have been known to travel 30 km or so, but usually they patrol a particular area looking for insects to eat. Mosquitoes, flies and midges are a large part of their diet and these are plucked from the air. This fact alone should endear these delightful creatures to us. In contrast to its enormous eyes, the dragonfly’s antennae (for sensing, touch and smell) are poorly developed and less important to it. The jaws have strong tooth-like projections for biting into its prey. They have three pairs of legs attached to the body just behind the mouth. These are used for seizing its prey in mid-air. Mating usually takes place in the air, then it is over to the female to lay its eggs into fresh water, the stems of water plants or into mud. After 2 – 5 weeks the eggs hatch into nymphs. These are called "mud-eyes" and are excellent bait for freshwater fish. They have the basic body structure of the adult insect but are fatter and without wings. The nymths are dull brown in colour and remain underwater until they are ready to change into adult dragonflies. They breathe by means of gills. Nymths are carnivorous (flesh eating) even tackling tadpoles and small fish. Dragonflies take anything from one to five years, and possibly even longer, to complete their Iife cycle. During its life as nymph the insect moults, shedding its skin, as many as ten or fifteen times. When the nymph is ready to moult for the last time, it comes out of the water and climbs up a plant above the surface of the water. After a short period of rest, the skin splits, the wings expand and a spectacular dragonfly emerges. The species ‘Trapezostigma loewii’ breed in warm still waters such as the flood plains of northern Australia. Their emergence as adults is often taken as a signal that the wet season was over. Dragonflies mark the end of the Yawuru season, Mankala (the wet) and the beginning of the short season of Marul. This was the time when Aboriginal people move back to the coast.It is amazing that dragonflies can fly forwards, sideways, backwards and hover (sort of like a helicopter). It is said that Di Vinci wrote many papers on the possibility of such an aircraft being possible after he observed the dragonfly. They are much loved and there are many internet sites devoted to their study and preservation such as the British Dragonfly society - http://www.dragonflysoc.org.uk).